Enrique Tellería (aka Jean Paul) was nicknamed "El Troglodita" (The Caveman) due to his wild performances in his native Peru. Screams, extreme body shaking and, quite often, stage destruction were part of his energetic show. During the mid to late 60s, as his reputation as a singer increased, he took part in a few local recordings and recorded a full LP of moderate success. This would soon lead him to further opportunities in other countries such as Guatemala, Ecuador, Panama or Mexico. 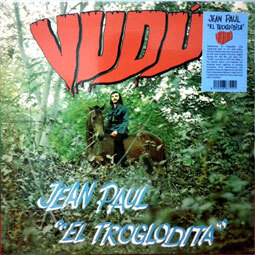 "Vudú" was his second LP, recorded in 1972 and released on Discos MAG. The first guitar chords of the opening track, with plenty of wah wah and fuzz effects, anticipate the vibe of the entire album: hard psych meets Latin funk. However, throughout the whole record Jean Paul's singing masterfully gravitates between mellow soul moments and extremely energetic doses of wildness... In fact, the seamless brass arrangements on this album bring memories of sophisticated US soul records.The members of the amazing band Laghonia play on this album as backing musicians, resulting in a masterpiece of unorthodox Latin psych at its best. There are no fillers here, almost every track could be a serious contender for making its way onto a 45, but the standout song 'Everything Is Gonna Change' alone would justify the need of having this album in any record collection. The very accomplished take on the Pop Tops original 'Any Time' is also worth a mention, and so is the amazing Latin soul number 'Te amo más', but the whole album is very solid from start to finish, and one of Peru's finest ever.Jean Paul's career would last a few more years until the mid-1970s, when his popularity started to slowly vanish.